The 26.21 metre sport fish yacht Three Amigos has been jointly listed for sale by Sean Doyle at Northrop & Johnson and Merritt Boatworks. Delivered in 2013 by Merritt to an in-house design, she boasts a fibreglass construction and teak decking. Tournament rigged and ready to fish and cruise, she can sleep up to six guests in three cabins, including an en suite master cabin, a VIP and a guest cabin with bunk beds. There is accommodation for a crew of two. Below deck, her custom interior was created by Patrick Knowles Design. It features an open plan main saloon with a drinks bar in one corner with fixed seating, a large television and a U-shaped cream sofa that faces inward towards a coffee table and two striped armchairs. Adjacent to the bar sits a dining table with U-shaped seating. Her spacious main aft deck has been fitted with a Bluewater fighting chair with rocket launchers in addition to two fitted viewing sofas on the air-conditioned mezzanine level. 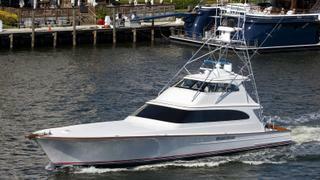 The flybridge above has a small al fresco dining area, and she also features a Jack Hopewell tuna tower. She is fitted with MTU engines give her a cruising speed of 30 knots and a top speed of 39 knots. Currently lying in Fort Lauderdale, Three Amigos is asking $8,290,000.